Everybody loves to predict a winner. With new three-star restaurants you often see that the third star has already been predicted by many, but occasionally there will be a new three-star restaurant that seems to have dropped straight from the sky - like a meteorite. In those cases, the restaurant wasn't on anyone's three-star radar, apart perhaps from the local foodies or the occasional lucky punter that stumbled upon it. 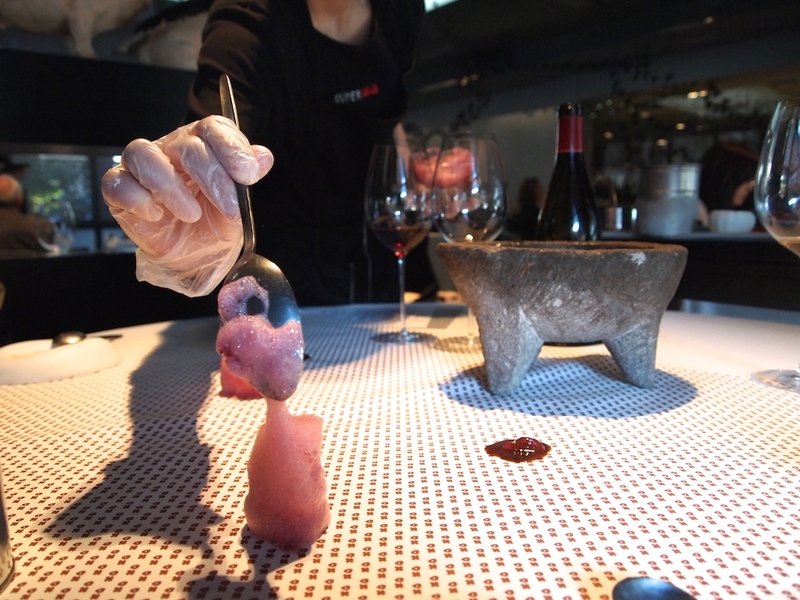 DiverXO offers two tasting menus. There's a 7-course menu for €115 and an 11-course menu for €170. 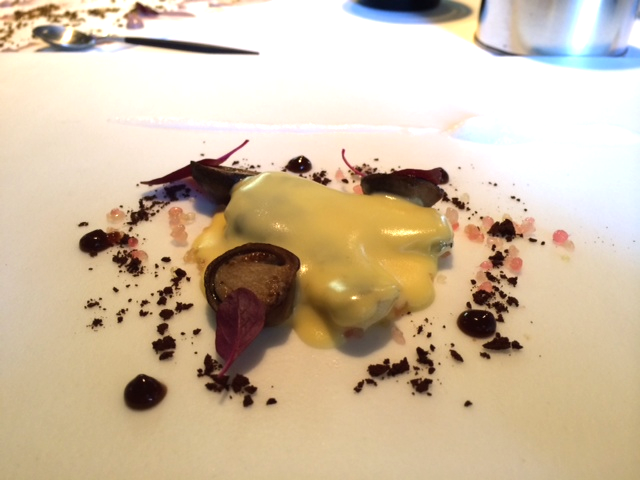 I had lunch at DiverXO with my husband on Thursday 3 April 2014 and we both had the 11-course tasting menu. 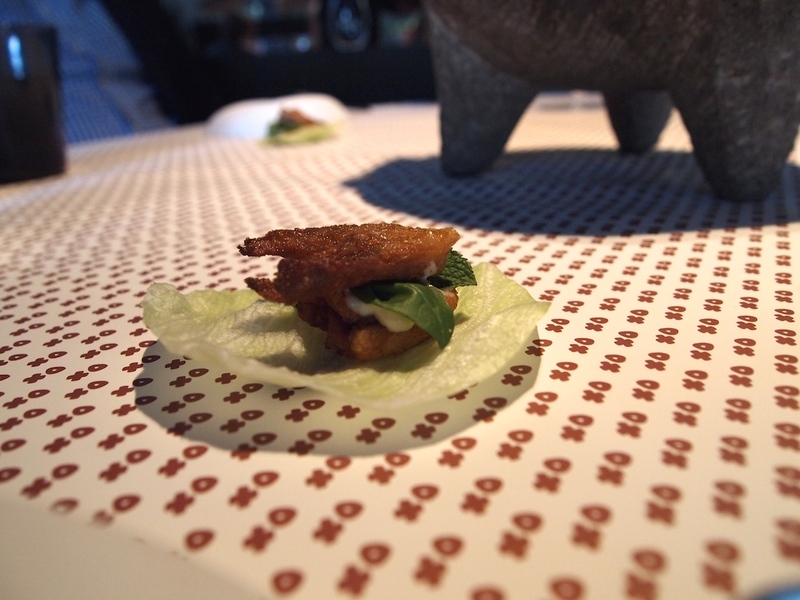 Interestingly, the dishes at DiverXO are called 'canvases', served on large square white slates made to look like canvases. 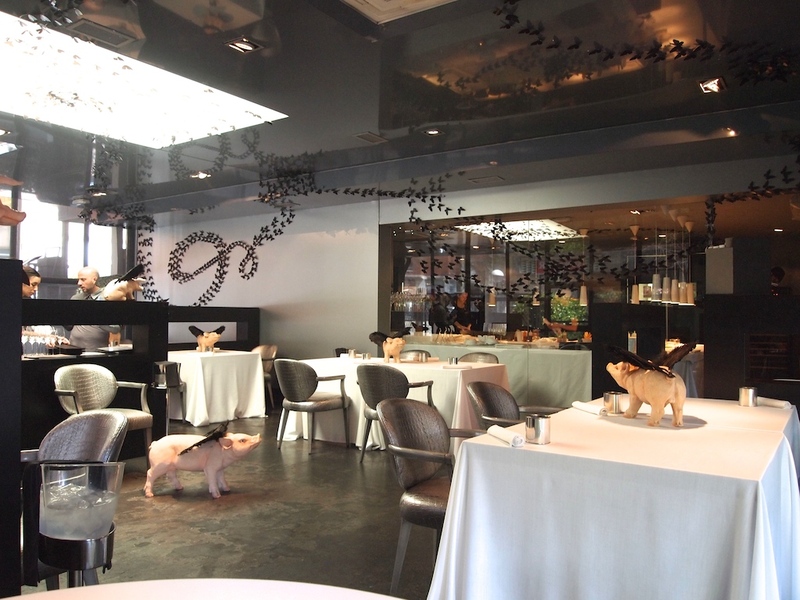 They are a clear example of chef David Muñoz' unconventional and individualistic approach to haute cuisine. 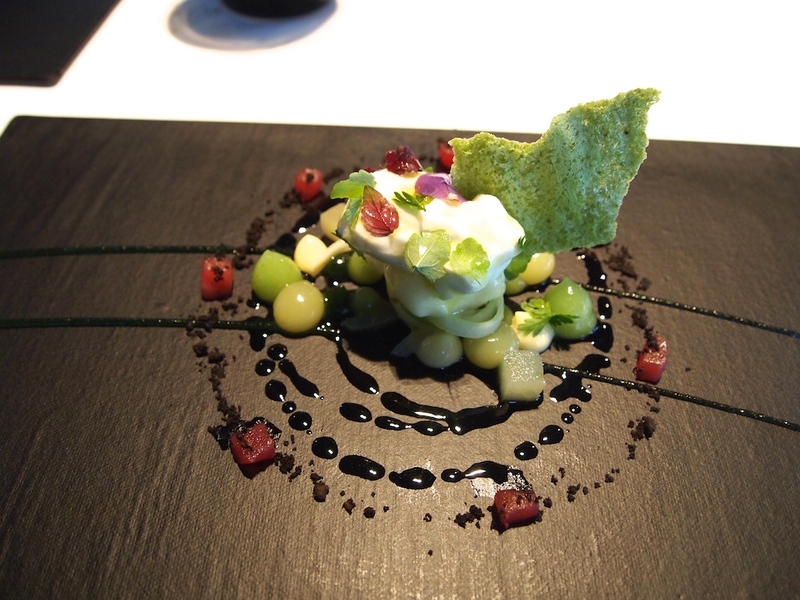 Lunch kicked off with edamame (Canvas 1), Kalamata olive puree and yuzu gel, served on a long white slate. With the edamame came a concentrated green tomato and chlorophyll soup, that had a nice touch of piquancy and a good, sharp finish. Shortly after we were served a soup of coconut, creamy baby scallops, clams and some pochas (white beans) and roe for extra crunch. 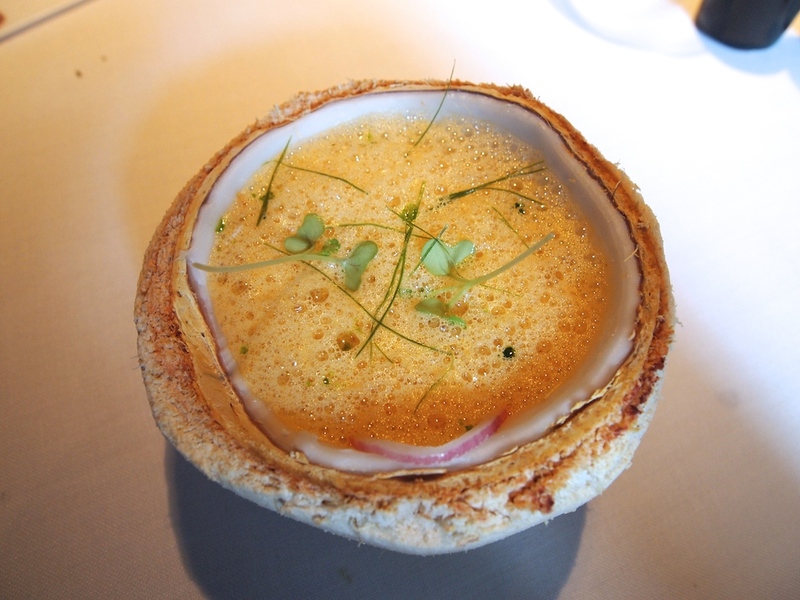 The soup was served in a halved coconut and with my spoon I was able to scrape out some fresh and silky coconut meat. A delightful and fragrant soup with a nice hint of kaffir lime. 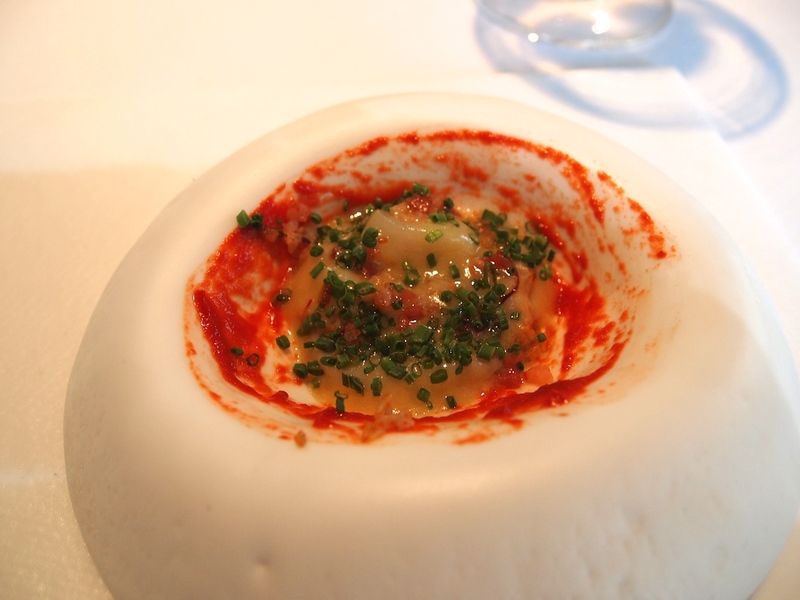 Equally good was a dish of sea urchin, buffalo buttermilk, kimchi, celery and fresh black truffle (no photograph). A lovely combination of flavours and textures and the kimchi delivered a nice touch of sweet heat. 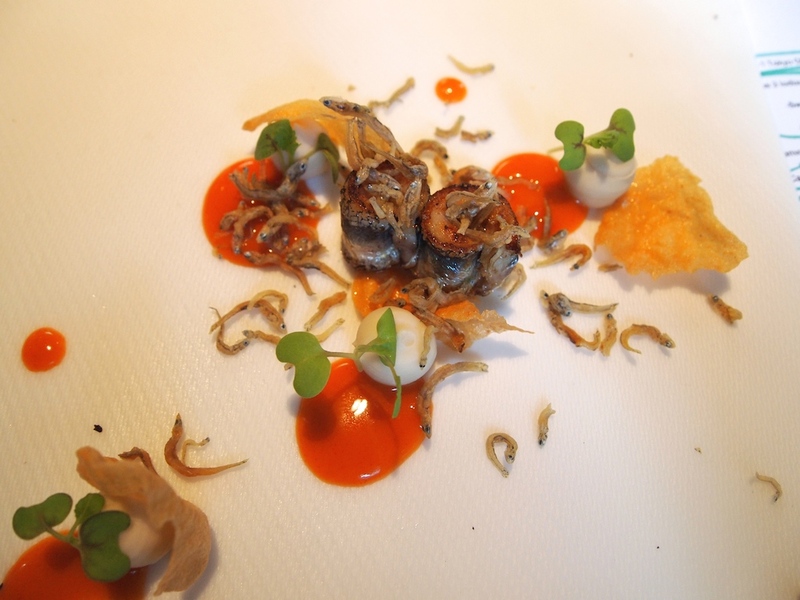 Then there were meaty grilled sardines, served with a thick and mildly spicy kimchi/chilli sauce, crunchy deep-fried baby sardines, a pochas and coconut puree and two rice crisps. 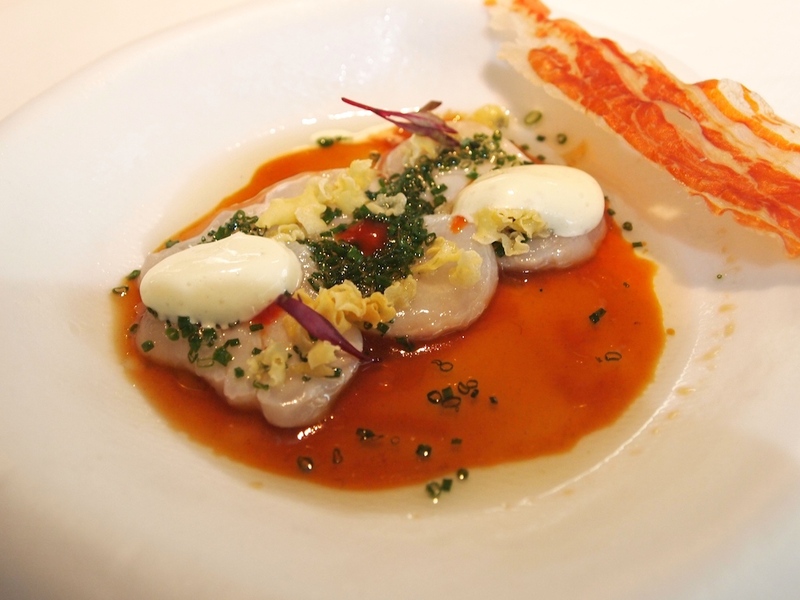 An exciting dish with balanced sweet, sour and oily flavours. 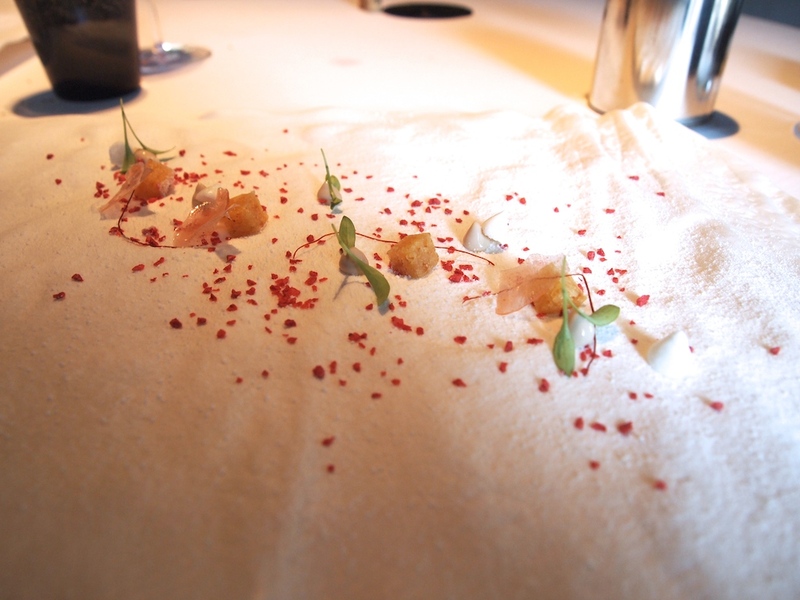 Next up was Canvas 3, Kokotxas pil-pil (hake throats) made with foie gras, instead of the traditional olive oil, and served with a horseradish foam, mushrooms, a few dots of Chinese barbecue sauce and a scattering of cocoa crumbs and finger lime vesicles. The foie gras pil-pil had a velvety, creamy texture, which combined beautifully with the tender, but still slightly firm hake throats, and together they produced a wonderful mouthfeel. 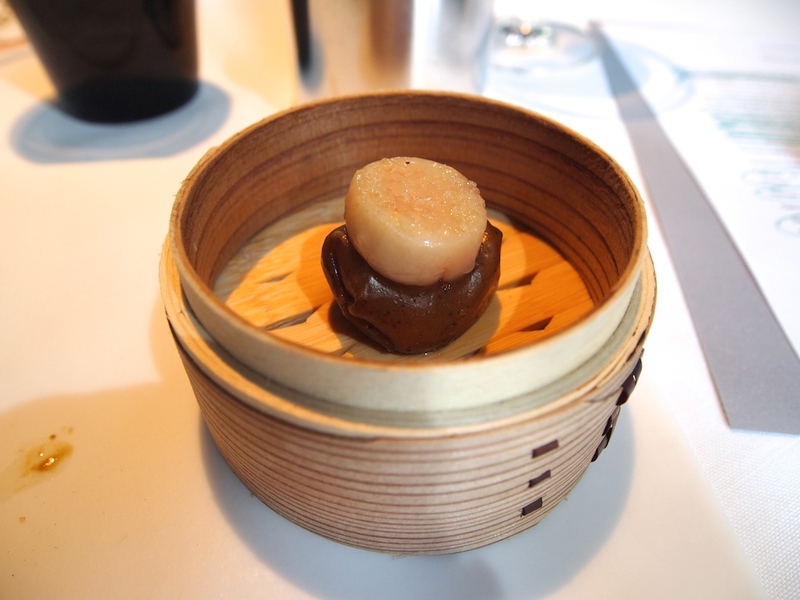 A highly creative and textural dish; the luxurious richness of the foie gras was balanced by well-judged bitters and acidity. This was followed by Canvas 4, described on the menu as "Nothing is what it looks like". The dish was introduced to us as glazed pork cheek, which turned out to be tuna! 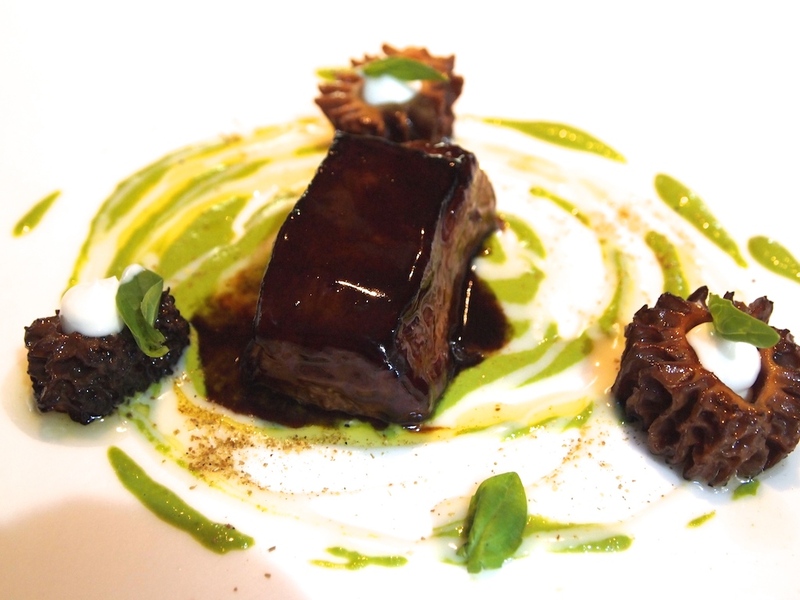 Dark ginger-glazed tuna, that indeed had a soft and delicate texture similar to pork cheeks, served with an intense basil sauce, Parmesan sauce, baby basil leaves, mushrooms filled with a sheep's milk cream and finished with a sprinkling of ground sancho pepper. 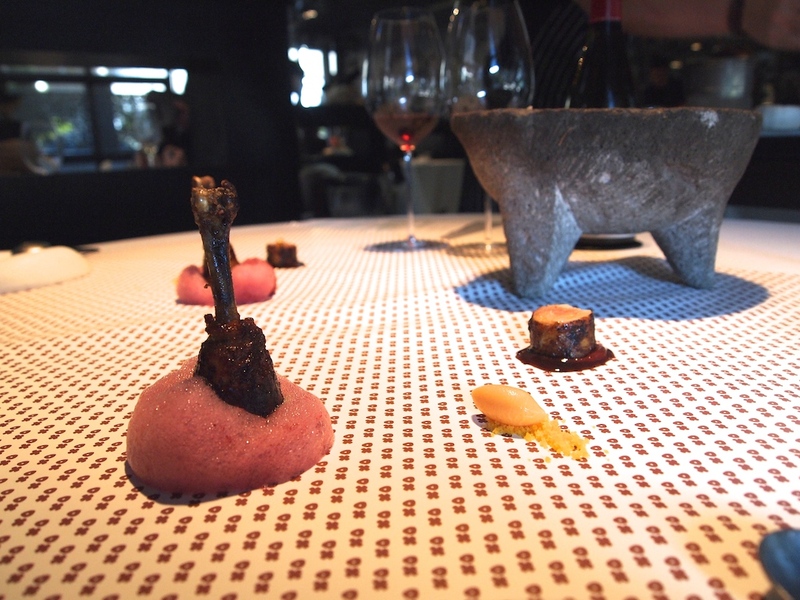 A Canarian potato dumpling with a slice of bone marrow was served on the side. A surprising combination, but the flavours all worked together and I loved the flavour profiles. First there's the dark meatiness of the tuna, with subtle heat from the ginger, followed by the herby sweetness of the basil, and rounded off by the nutty-sweet Parmesan cheese. 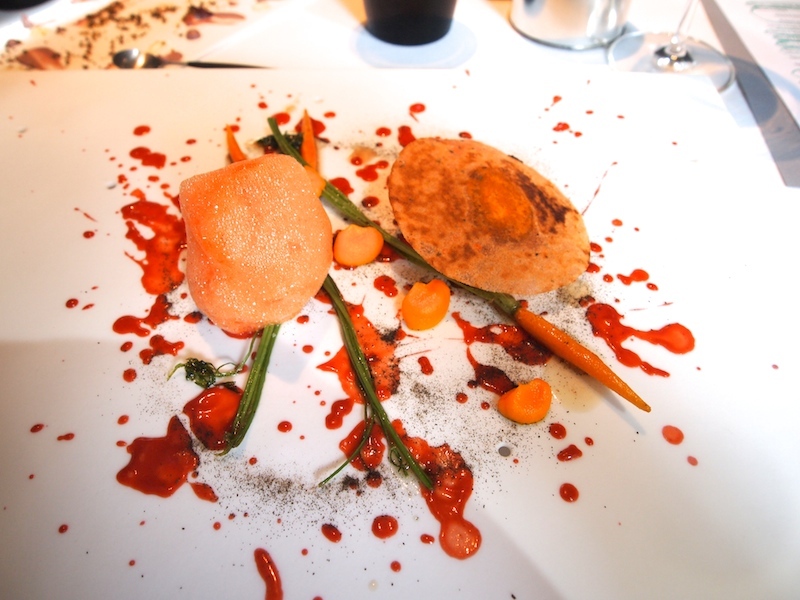 The next canvas (5), called 'Hannibal Lecter', was comprised of a splash of spicy tamarillo ketchup, carrot puree, carrot foam, baby carrots, a duck and mole potsticker, some brown butter and a sprinkling of lapsang souchong dust. 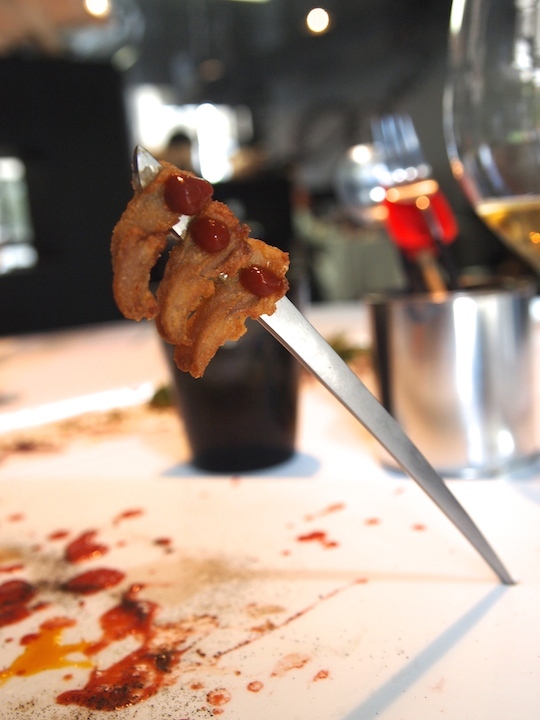 A duck tongue and chipotle skewer was served on the side. 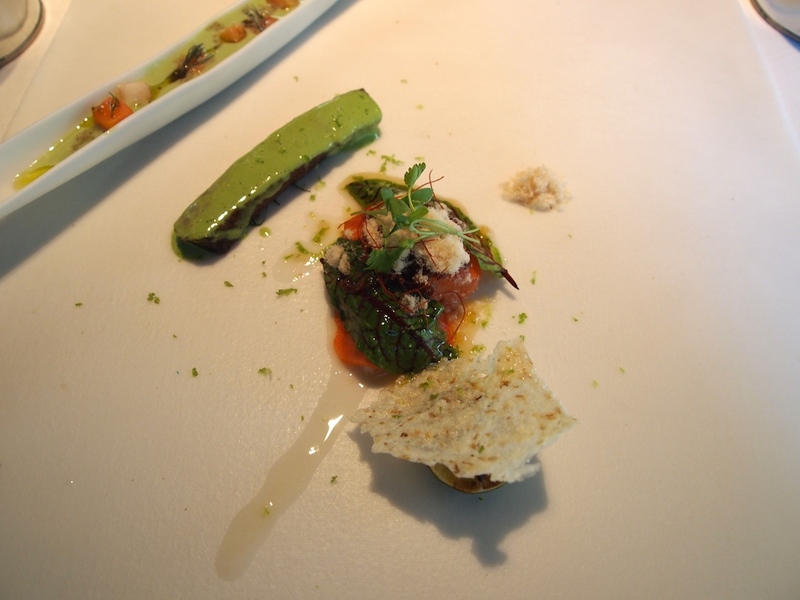 A sensational dish with incredibly powerful and pure flavours, that was quite an experience to eat. Wonderful sweetness from the carrots and the intensity of the carrot foam was extraordinary; it was like eating 50 carrots at once. Loved the sharp, spicy edge of this dish. 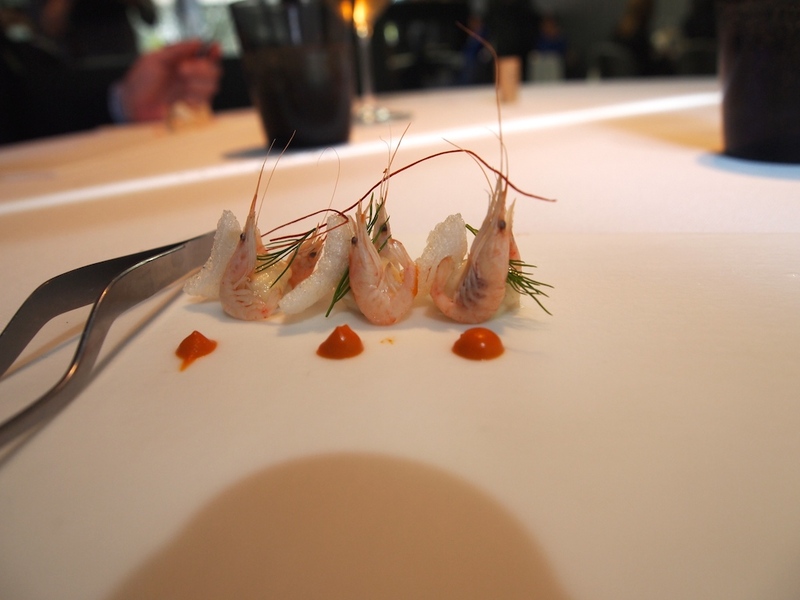 Then there was a dish of of crisp baby prawns, prawn cracker, a white asparagus and Riesling crème, a concentrated prawn puree, garnished with dill. A delicious bite that turned out to be only a precursor of the the real thing, which followed a couple of minutes later. On the plate were juicy Camarones (shrimp), glazed white asparagus, prawn puree, dill, white asparagus shavings, and a sauce made with the prawn cooking juices. 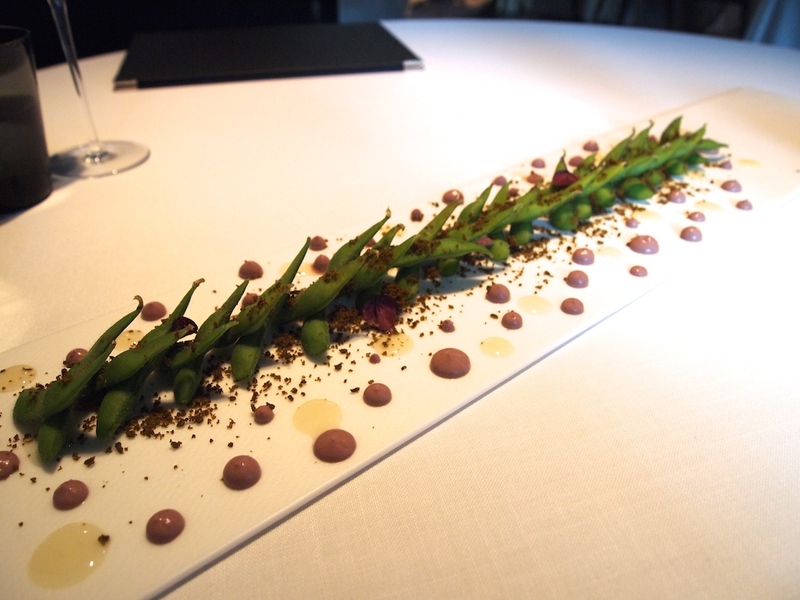 Subsequently we were served a spoon with a concentrated tomato sorbet and a delicious white asparagus and Riesling dumpling. 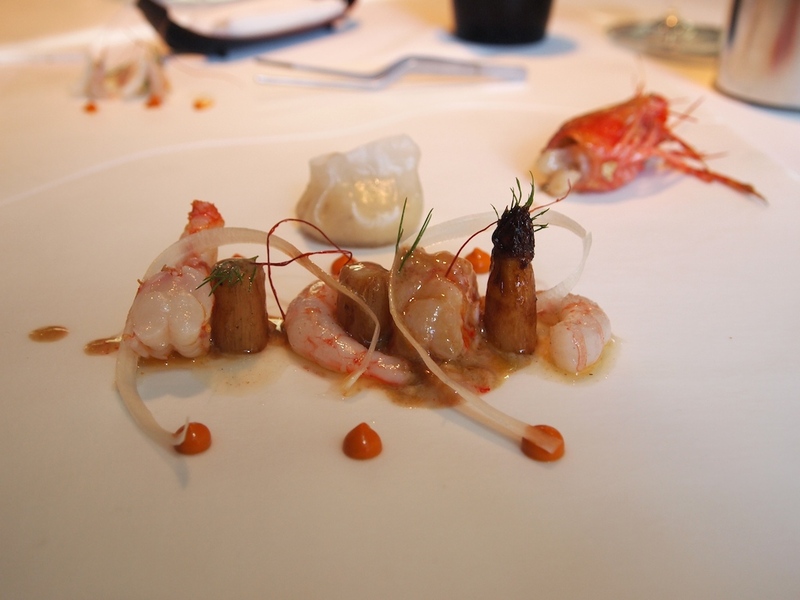 An elegant and balanced dish, the delicate prawns married well with the white asparagus and prawn puree had great depth of flavour. Two preparations of cod followed (Canvas 7). To start there was Cod a la Bilbaina. Thin slices of cod, seared in hot olive oil, accompanied by spicy mayonnaise, fresh chives, crispy bacon and a few drops of chilli sauce, complemented by a vinegary and pungent Bilbaina sauce that had a terrific touch of peppery smokiness. The cod had just firmed on the outside and was tender and creamy on the inside, the creaminess combining wonderfully with the sweet and sour flavours in the dish. An outstanding dish with beautifully balanced acidity and a well-judged touch of warmth from the chillies. Equally good was a wonderfully intense dish of sliced cod tripes with spider crab, bacon, chives and a bittersweet soffrito sauce. Also served was a piece of soft-shell crab, which was lovely but didn't really add anything to these already great cod dishes. Time for Canvas 8. 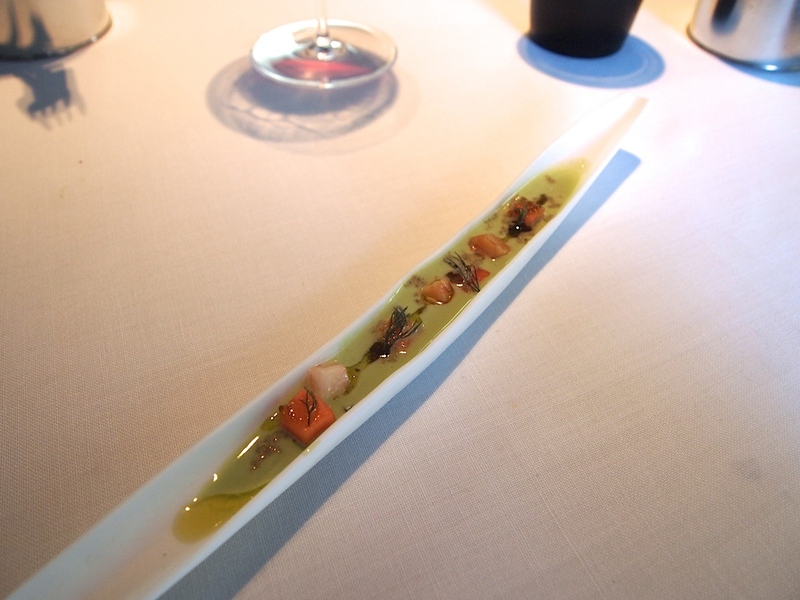 First to arrive was a creamy green Gordal olive emulsion with bone marrow and papaya. A lovely combination with balanced sweetness and a nice bitter finish. Even better was a piece of beautifully cooked Wagyu beef, covered with a gorgeous mustardy dressing of fresh green herbs, green chillies, sesame oil and fish sauce. Alongside the beef was a divine, fresh papaya and fried onions salad, garnished with fresh herbs and prawn 'dust', served with a grilled lime, whose juices enhanced all the flavours. Overall a dish with many flavours but balanced out beautifully. 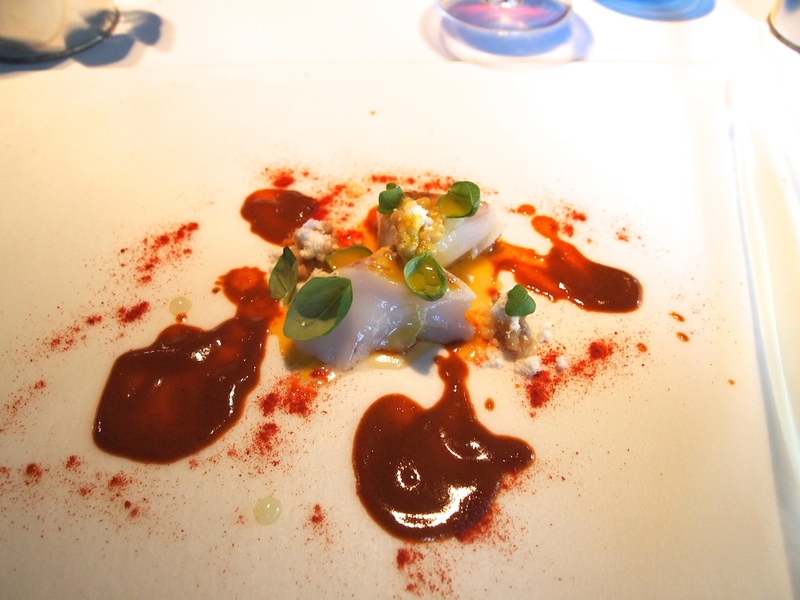 Canvas 9 was hake, marinated in salted water and then aged for two days, walnuts, bergamot jelly and a soft 65°C egg yolk, served with a wonderfully warm and spicy smoked pimenton and chilli sauce. The intensity of the hake flavour was amazing and it married really well with the warmth and heat from the sauce. A brilliant dish that lingered on the palate and paired well with the white port that came with this course. Then there was Rabbit in three servings. 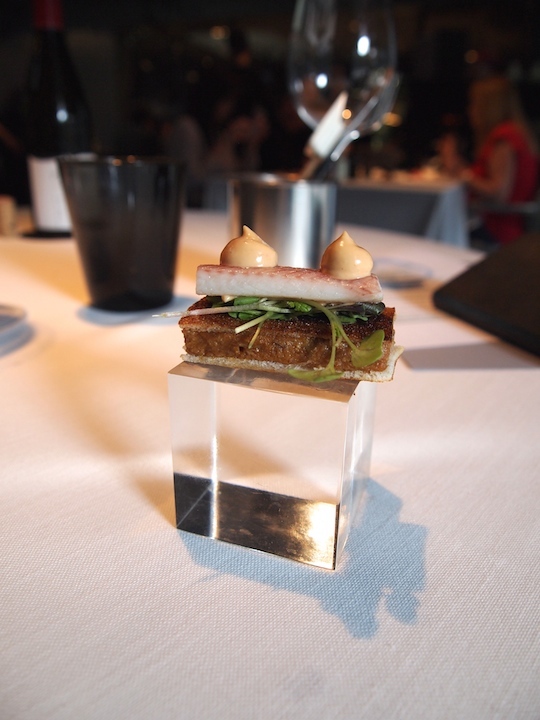 First there was a delicious and very elegant rabbit and smoked eel sandwich topped with two dots of chipotle mayonnaise. With this sandwich came a glass of sherry that added a nice touch of nuttiness. 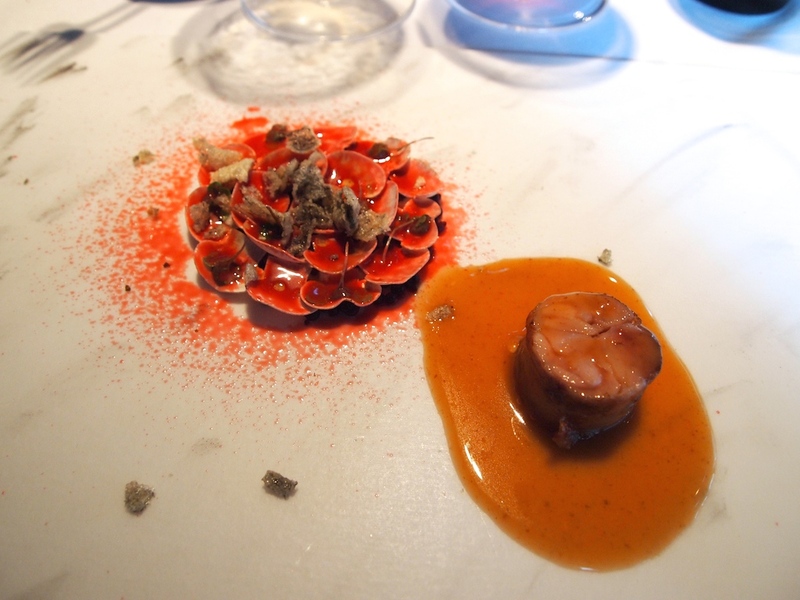 The second serving was tender and succulent saddle of rabbit, complemented by an intense Iberico pork sauce and a layered salad of red fruit, thinly sliced fresh mushrooms, a colourful hibiscus dressing that was sprayed of the salad and then sprinkled with some crispy eel skin. 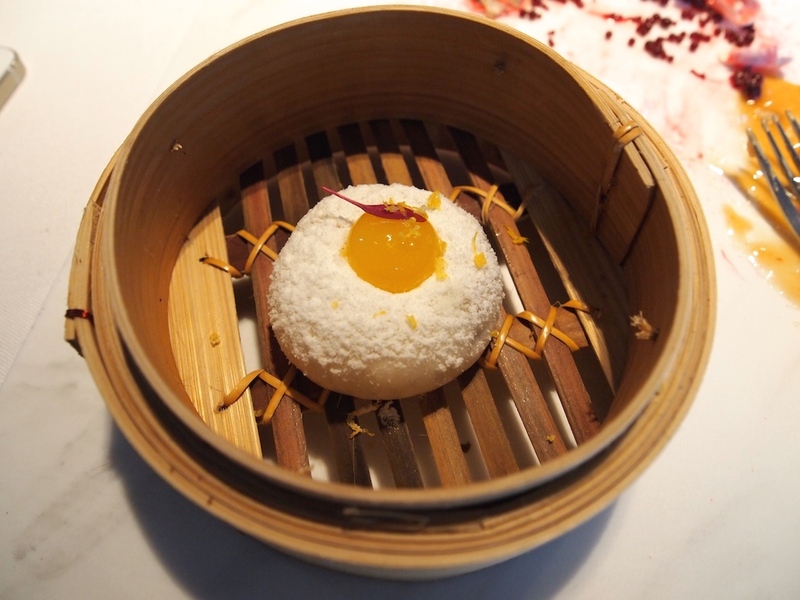 Finally there was a steamed bun with a rabbit stew filling, topped with a tangerine sphere and garnished with some grated bergamot. Three exceptional dishes, each delivering an elegant richness and a variety of components to counterbalance this richness. There was the spicy mayo in the sandwich and the tart, mildly acidic hisbiscus with the saddle of rabbit; the tangerine sphere did an excellent job with the steamed bun. Next our table was covered with an 'XO' tablecloth onto which a large pestle and mortar was placed. In the pestle and mortar was a tangy Mojito and rhubarb sauce to accompany a chicken wing wrap, but first we were served a powerful chicken soup with tapioca pearls. This was followed by the aforementioned chicken wing and lettuce wrap, to be dipped in the Mojito and rhubarb sauce. Last up (plated on the XO tablecloth) was a tender and sticky chicken leg, coated in a mixture of warm spices and served with a nice and sharp rhubarb foam, silky egg yolk ice cream and egg yolk crumble.This was complemented by a piece of succulent chicken thigh meat, served with a hibiscus puree/sauce. A lot of things were happening on this XO tablecloth, but surprisingly it all worked incredibly well. A line-up of outspoken but balanced flavours, nothing was overwrought and the execution was flawless. Time for dessert. The first dessert was a salad of different textures of pineapple, celery and apple. Placed around the salad were small cubes of tuna. A lovely interplay of distinctive flavours and a nice contrast of textures. I didn't recognise the tuna as such at first, but once I knew, I noticed the tuna cubes delivered a mild tuna flavour that married well with the other sweet and fresh flavours. Second dessert and last course was an unlikely but very pleasing combination of coconut snow, (freeze-dried) strawberry, kimchi and Jasmin. Hidden underneath the velvety coconut blanket was a delicious 'puddle' of strawberry and Jasmin coulis. This is the sort of meal that leaves you speechless but also slightly baffled, wondering what the hell just happened here. The pace was as breathtaking as the array of flavours. This is machine-gun cuisine, gastronomic shock-and-awe, just about the most intense experience I can remember in any three-star restaurant (of the 50-odd I have visited so far). 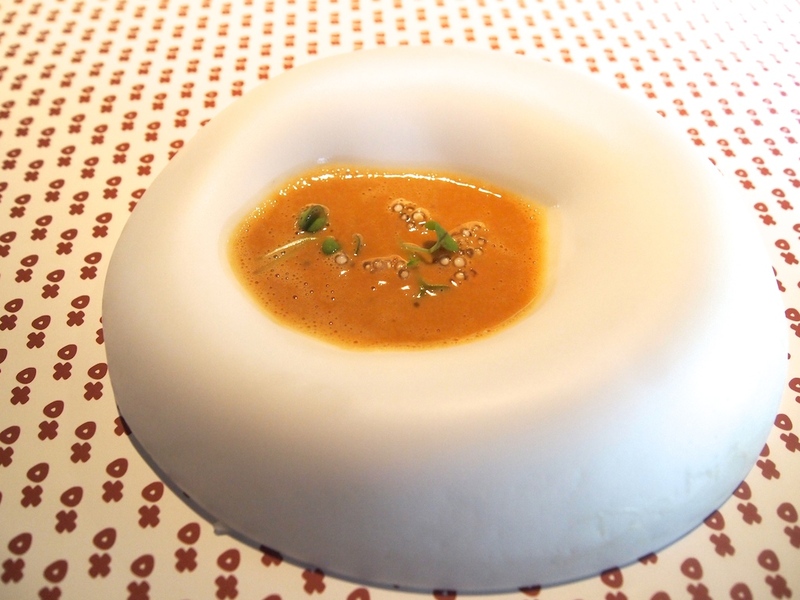 David Muñoz delivers inspired, extremely individualistic and often eccentric food, but in spite of their unique character, the dishes are surprisingly self-evident. The canvases may seem playful and even rebellious, but his food is deeply serious. With its intuitive technique it always strikes the right chord, its ingredients provide an unconventional flavour kick and the tension achieved on the plate demands your attention until the very last bite. I felt that one or two dishes might have been slightly overcomplicated by unnecessary extra elements, but this is really splitting hairs. This is mind-blowing, very personal, sometimes slightly mad cuisine that has 'genius' written all over it. Beware, all ye who enter here!